When people lose their homes, they lose their security and belongings, and they lose dignity and privacy. 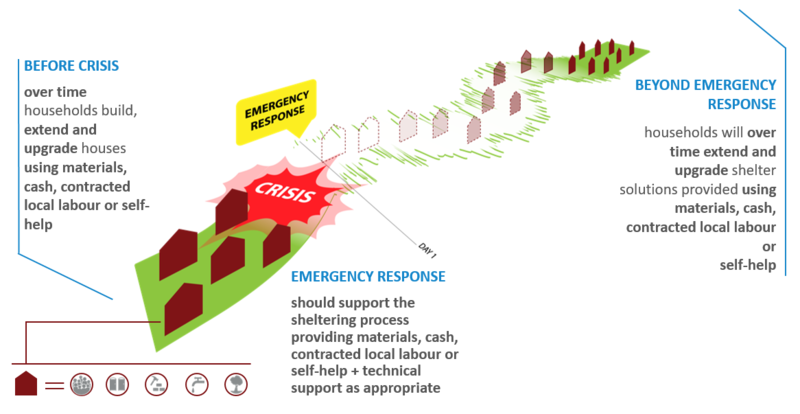 Emergency shelter protects vulnerable people from danger, suffering and exploitation. When people lose their homes they also lose their largest financial and social assets; they lose their sense of belonging and family heritage. The home may be the work-place, and they may lose the ability to earn. Exposure to the elements, over-crowding and a lack of washing facilities makes people ill. An unfamiliar environment and the lack of privacy can be traumatic. Poverty and the loss of livelihood makes rebuilding and recovery hard. 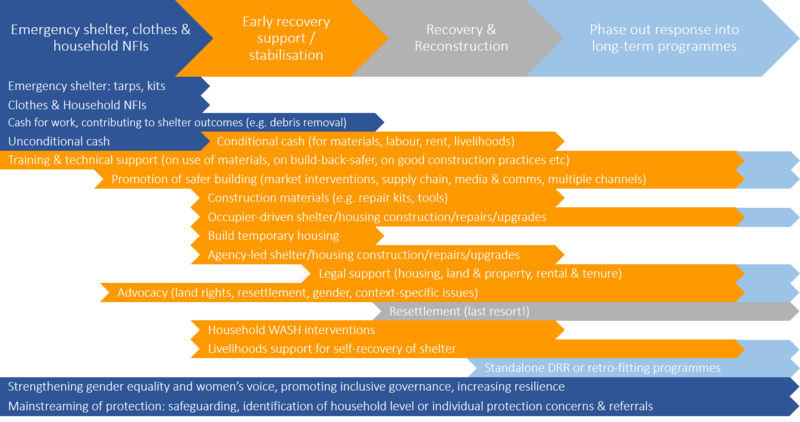 Supporting vulnerable people to recover adequate and dignified housing after disaster is central to CARE’s mission to defeat poverty and achieve social justice. Shelter activities can have multiple positive effects. Restoring housing can improve physical and mental health. It can empower people to provide for themselves through livelihood activities. In addition, shelter activities themselves create further benefits. Construction creates temporary employment for those who are unable to access their normal livelihoods through labouring and manufacture of building materials. This can boost the economy that has been affected by the emergency. Repair and reconstruction can lift community morale. Emergencies can also provide an opportunity to sensitively redress inequalities in control and ownership of assets, land and property. Humanitarian or emergency shelter is relevant in cases of natural disaster, conflict or displacement where people have lost or abandoned their homes. It includes physical protection from the elements as well as providing a safe, dignified place to live. There is a multitude of options for the delivery of humanitarian shelter: including non-food items (NFIs), cash transfers, advocacy, kits, training, repair programmes, construction of temporary housing and more. Shelter programming is not confined to the construction of temporary houses or the provision of NFIs. The scale is often unimaginable – a quarter of a million homes destroyed is not unusual for a major disaster. Our challenge is to have a significant impact that leaves a legacy of DRR and improved building practice. The affected population is the first responder and the most important stakeholder. The community, whether affected by natural disaster or forcibly displaced due to climate change or conflict, is always the first on the scene and the first to provide shelter assistance. In major emergencies it is not uncommon for 80%, or more, of the population to rebuild their own homes in a process of self-recovery and it is clear that rebuilding better, safer homes is vital to reducing vulnerability and increasing community resilience. Shelter responses are always context specific. No two emergencies are ever the same: there are virtually no off-the-shelf solutions. While learning should be shared and lessons can have universal application, it is nevertheless true that each disaster is unique and demands an un-blinkered and unprejudiced approach. The expertise, knowledge and development experience of local partners and COs are essential to the successful outcome of a shelter project. Shelter programmes should be holistic and integrated. Shelter is more than just walls and a roof. CARE always looks for ways to respond to shelter needs that reflect a broad, holistic approach – and one that doesn’t necessarily imply construction. A good shelter programme will have a positive effect on gender equality, DRR, accountability, health, well-being, livelihoods. A house and home that is durable and appropriate is a step towards resilience and the reduction of long-term vulnerability. There is a multitude of options for the delivery of shelter programmes. Shelter programming is not always about tents and construction, nor just about providing household NFIs (stuff). People’s lack of shelter can be addressed by providing shelter directly, but also by providing cash, by supporting incomes and livelihoods, by giving people access to tenure and ownership rights, by providing technical assistance and training, and more. Good shelter programming will always have a strong focus on women and girls. CARE’s shelter programmes should focus on ensuring dignified protection of people against the elements (wind, rain, cold, heat etc) and other risks (gender-based violence, theft, trauma, exploitation, natural hazards etc) during an emergency and during recovery or stabilisation. CARE’s shelter programmes should be inclusive and meet the needs of all women, girls, men and boys, and also take opportunities to empower women and girls. Women and girls spend a disproportionate amount of time in their homes: a good shelter programme will involve and empower women. Collecting and analysis of disaggregated information is essential to understanding the context for design of shelter programmes. Women and girls should be centre stage in every phase of the process. The Global Shelter Cluster is part of the IASC Cluster System. The shelter cluster is co-led by the IFRC and UNHCR. When the shelter cluster is activated at country level, it is led by IFRC in cases of natural disaster or UNHCR in cases of conflict (occasionally other international organisations lead country-level shelter clusters). The Camp Coordination and Camp Management (CCCM) cluster is co-led by IOM (natural disasters) and UNHCR (conflict related displacement). CARE is rarely involved in camp coordination and management, although does provide services in a number of camps around the world. CARE has adopted shelter as one of its core humanitarian specialisms because of the clear humanitarian need. Moreover CARE is one of the few major dual-mandated agencies that counts shelter as one of its core competencies. We play an important role advocating for considered and high quality shelter programmes within international forums including the Global Shelter Cluster. By delivering shelter programmes we not only respond to a huge humanitarian need, but we also aim to increase the take-up and quality of shelter across the humanitarian community. CARE is a member of the Strategic Advisory Group of the Cluster and leads the Gender & Diversity Community of Practice for the Global Shelter Cluster. For more information contact emergencyshelter@careinternational.org. If CARE Country Offices would like to strengthen their national shelter clusters or other coordination mechanisms the shelter team can second staff to the cluster teams if funding is in place. The shelter sector uses a great deal of specialist terminology and jargon. This can help to simply describe the situations and programmes encountered in humanitarian shelter, but can also obscure meaning and make it difficult to explain what a particular shelter project is trying to achieve. This is particularly problematic when explaining projects to the recipients of shelter projects, especially where the terms do not translate into their languages clearly. Practitioners should take great care to ensure that all those involved in projects fully understand the terms they are using, and agree upon a common definition. recovery; it works with existing structures and can be scaled up. Collective centres A building or covered space which is used to house multiple (usually five or more) households or families in the same space. While the space my be superficially subdivided to provide privacy, individual households will not have their own secure spaces. Schools and other public buildings are often used as collective centres. From the CCCM cluster Collective Centre Guidelines: “Collective Centres are pre-existing buildings and structures used for the collective and communal settlement of the displaced population in the event of conflict or natural disaster.” Collective centres typically fall under the auspices of the CCCM cluster, not the shelter cluster. Cookset An NFI kit of pots, pans and kitchen implements. Core house Similar to a one-room shelter, this is a permanent, durable and strong, but small, house. The aim is that the occupants can expand the building over time, but have a safe place to live in the shorter term. Core houses are typically engineered structures. Durable shelter Durable shelter is a term often used interchangeably with permanent shelter, to describe a shelter intended to last typically more than 10 years. CARE discourages the use of ‘durable shelter’, and instead prefers to describe the actual design life of the structure and its components. Durable solutions Not to be confused with durable shelter, durable solutions is a term used, most often in the context of refugees, to describe a long-term or permanent solution to their displacement – typically meaning voluntary repatriation, local integration, or resettlement in a third country. Emergency shelter Emergency shelter is any form of shelter that is used in the immediate aftermath of a shock, disaster or crisis. It can include tents, emergency shelter kits, plastic sheeting, hotels, emergency rentals, hosting and more. It is typically only for the short term (weeks & months, not years), but often due to lack of a availability of longer term shelter solutions can be used for longer. Emergency shelter kit Emergency shelter kits are kits of materials (see NFIs) which can be used to form emergency or makeshift shelter. A standard kit includes as a minimum 2 high-specification tarpaulins and a length of rope, but may also include tools and fixings. GSC (global shelter cluster) The Global Shelter Cluster is part of the IASC Cluster System, which coordinates humanitarian response in many crises. Hosting Shelter provided by host families – where people voluntarily take in displaced people in order to provide them with shelter. House 1. Noun: a building or structure in which someone lives; a dwelling. 2. Verb: to accommodate someone inside a dwelling. A house is typically something that is permanent, and includes the social, economic and cultural conditions that are required for adequacy and permanence. Household NFIs (non-food items) Household non-food items is a term used to describe the selection of NFIs that is typically considered to be part of the shelter sector’s remit. They include clothes, bedding & blankets, kitchen sets or cooksets, stoves and fuel for heating and cooking, lights etc. They exclude NFIs which are related to WASH (buckets, water containers, water purifiers) and mosquito nets. Informal (tented) settlement They are a group of tented of other types of housing units established by the IDPs themselves or by non‐experienced actors, often erected on land that the occupants have no legal claim to. Makeshift shelter A non-engineered shelter constructed from basic materials, often salvaged, scavenged or donated materials, to meet immediate shelter needs. NFIs (non-food items) Non-food items are things, (ie. material goods, or commodities), which are given to people in need in humanitarian responses. Permanent shelter Permanent shelter is a term used to describe a permanent dwelling, most often a house, although it can also refer to long-term, sustainble rentals, or other lasting shelter solutions. There is actually no such thing as ‘permanent’ shelter, in that every building or shelter arrangement will have ongoing costs and maintenance requirements. Permanent shelter therefore usually refers to shelter solutions which will last many years, and buildings which will last in excess of 10 years. CARE recommends great care in the use of this term, and recommends explaining the actual intended or expected timescales involved. Planned camp The structures that are established by an accountable humanitarian actor and to the extent possible, meet the minimum SPHERE standards. The site was chosen by the humanitarian actor and, where possible, the infrastructure was established before the arrival of some IDPs. Plastic sheeting In the case of humanitarian aid, this refers to woven and laminated plastic sheeting. See https://www.wired.com/2016/01/tarpaulin/. Reception centre A temporary shelter or group of shelters that was erected to provide extremely short‐term support to IDPs while they are registered and referred to alternative housing solutions. These sites are often established during extremely large displacements. SAG (strategic advisory group) The Global Shelter Cluster and National Clusters are guided and advised by the Strategic Advisory Group, made up of participating agencies and other stakeholders. Self-recovery In humanitarian shelter programmes, this refers to people designing and building their own shelters, and largely using their own resources to do so. ‘Self-recovery shelter programmes’ will seek to provide technical assistance, materials and cash in some combination in order to support this process of self-recovery. Semi-permanent shelter The term semi-permanent shelter is used to refer to buildings which have some aspects of a permanent house but other aspects which are temporary. CARE discourages the use of this term, as it is poorly understood, confusing to beneficiaries and others, and often used to justify poor quality design or to obfuscate the real intentions of the programme. It is better to state the intended design life of the shelter and its primary components. 2. Verb: being protected or shielded from the environment, elements and weather. Shelter is often used interchangeably with ‘house’, but this should be done with care. A ‘shelter’ is typically something that is inherently basic, incomplete or not suitable for permanence. Shelter cluster Part of the IASC Cluster System, the Shelter Cluster coordinates shelter responses when the system is activated. It is led by IFRC in natural disasters and by UNHCR in conflict situations. Temporary shelter Shelter which is intended only for temporary use. CARE suggests great care in the use of this term, and suggests stating the intended design life of the shelter and its primary components. Transit centre or camp A temporary shelter or group of shelters that was erected to provide extremely short‐term support to IDPs while they are registered and referred to alternative housing solutions. These sites are often established during extremely large displacements. Transitional shelter Emergency shelter which is intended and designed to be upgraded, re-used, re-cycled, or moved following its emergency use. CARE discourages the use of this term entirely because it is poorly understood and confusing to beneficiaries and other stakeholders. The term transitional does not translate into many languages. It is preferable to explain more carefully with longer prose exactly what the intentions of the shelter are, and to state the intended design life of the shelter and its primary components. Winterisation / winterisation kit Winterisation is the preparation of a shelter or building for winter, by sealing holes, adding insulation, adding flooring, and taking other measures which avoid the shelter being dangerously cold or wet in winter. A winterisation kit is a kit of materials, accompanied by guidance, for winterising a shelter.